Liam Daly celebrates a late equaliser the last time Brakes and Stourbridge were paired together in the FA Cup. Leamington will be renewing rivalries with a familiar foe tomorrow when they make the trip to Amblecote to face Stourbridge in the FA Cup second qualifying round. The two sides met in December when the Glassboys prevailed in the FA Trophy first round proper but it was Brakes who came out on top the last time the two sides met in the FA Cup, progressing with a 2-1 replay win at the War Memorial Athletic Ground in 2012. It was the two sides’ clashes in the Southern League, however, which form the basis of their intense rivalry, with the presence of five former Brakes in the Stourbridge ranks – Paul McCone, Stuart Pierpoint, Rob Thompson-Brown, Leon Broadhurst and Chekaine Steele – adding further spice to the tie. “The cup seems to throw up these ties,” said Paul Holleran. “We come across each other that much and most of the time there is not much in the game. “It’s a tie that’s probably come a round or two early for both clubs. “Our levels are good and Stourbridge have started well. “League One and Two teams have fallen there and it’s a sort of local derby with both teams having risen through the leagues together and knowing so much about each other. 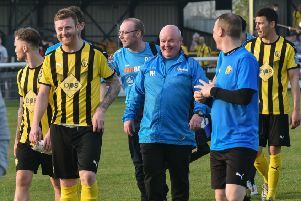 Brakes sit just outside the Conference North play-off spots following their 2-0 victory at Blyth Spartans last weekend and will be expected to progress against their Southern League Premier Division Central hosts. However, Stourbridge boss Gary Hackett says his renowned cup fighters will relish their underdog tag. “We know Leamington will be favourites as they are doing well in a higher division but they will have the pressure of the occasion,” said Hackett.